Donald Trump's transition team released a statement on Tuesday morning announcing the latest additions to his presidential cabinet. 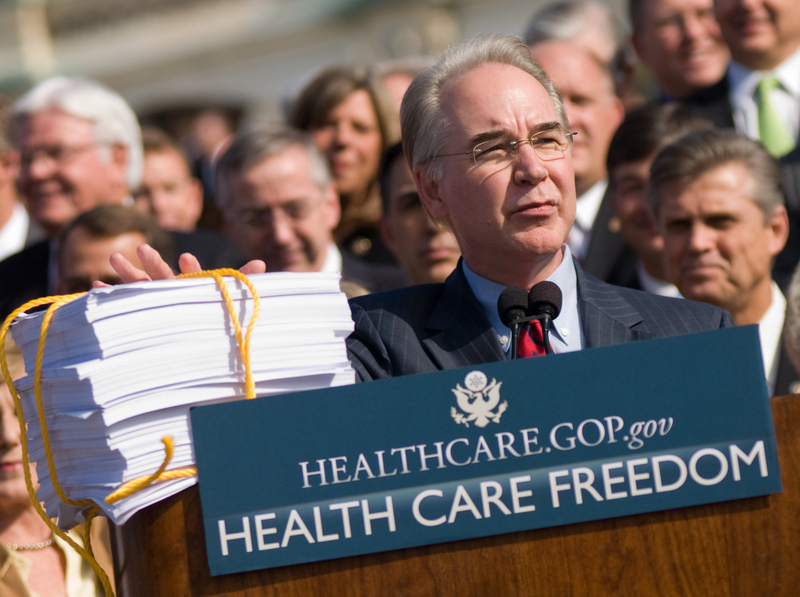 The new member is Rep. Tom Price, a fierce Obamacare critic, who will take on the role of secretary of Health and Human Services. "Obamacare doesn't solve healthcare challenges. It makes them worse. Real solutions empower patients w/ access to affordable choices," he tweeted once. If you are familiar with Price's views and are pro-choice, pro-birth-control, and/or pro-affordable-healthcare, you might be wondering if there's anything you can do to protest his future at the White House. One way you can make your voice heard is by calling your representative, but another way to protest Tom Price's cabinet seat is to start a petition. Price is staunchly anti-abortion — he led the effort to pass the Protect Life Act in 2011, an amendment to the Affordable Care Act that would've stripped federal funding from health insurance plans that covered abortions and permitted hospitals to deny abortions to pregnant women whose lives were endangered. He's also voted to defund Planned Parenthood multiple times. He opposes the ACA provision that covers birth control without co-pays, and in 2012 he claimed that all women in the United States can afford oral contraceptives. “Bring me one woman who has been left behind. Bring me one. There’s not one,” he said. In addition to women, Price's ACA replacement plan would take aim at provisions that aid low-income Americans. Since we're in the digital age, it's easy to start a petition and get the word out there. The official White House website requires 100,000 signatures for a petition to receive an official response. Since the Obama administration will continue to govern until January, any petition that reaches this threshold before Trump's inauguration will be answered by Obama. Some other popular platforms to consider are Change.org and MoveOn. Price wouldn't be the first Trump cabinet pick to spark enough outrage to launch petitions calling for a reversal of his decision — nearly 375,000 people have signed one petition urging Congress to stop Steve Bannon from serving as a White House chief strategist and senior counsel. Another one has more than 190,000 backers. Whether or not Trump or Congress adheres to these petitions' demands is ultimately out of your hands, but voicing objections to his decisions is vital in order to put pressure on his administration.